2019 Best Baitcasting Reel Under $100 – See Our Top 10! 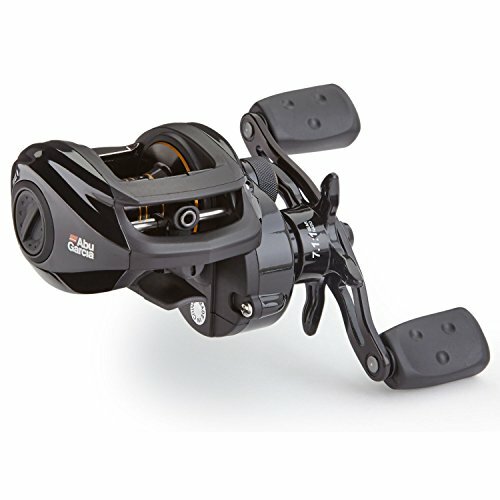 2019 Best Baitcasting Reel Under $100 - See Our Top 10! Baitcasting reels are fun and easy to use once you know what you’re doing. 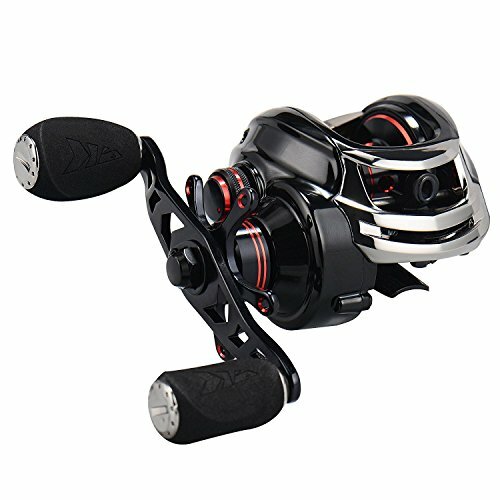 Normally, these kinds of reels come with multiple adjustment options which enable you to enhance your casting prowess. Unfortunately, though, most anglers keep off baitcasters due to some common misconceptions. For instance, there’s a notion that these reels are difficult to learn. In fact, the mere mention of the term “bird’s nest” is likely to evoke a reluctance to give these reels a try. The truth, however, is that with a bit of practice, baitcasting reels can be pretty easy to master. What Makes Baitcast Reels Different? 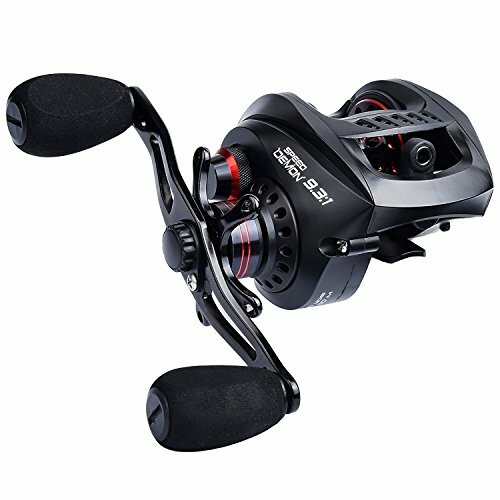 In definition, baitcasters are a special kind of reels featuring a revolving spool that also sits atop the casting rod alongside a trigger handle. Interestingly, that’s the exact opposite of spinning reels which are designed to sit underneath the spinning rod. In fact for spinning reels, the line guides face downward. The main benefits of baitcasting include the fact that you have a bit more control over the cast. For instance, you get an awesome variety of braking systems to prevent backlash. Indeed, if used appropriately, this reel type can transform your angling experience to a large extent. So, today we’d like to dedicate our effort to list down some of the best baitcasters we could find at the under $100 price range. The table below is just a precursor, the in-depth reviews are the real deal. This unique, low profile baitcaster is designed to deliver nothing but a 25lb carbon fiber drag. As you might be aware, that’s just the right kind of drag needed to handle most saltwater monsters. And just in case you’re going to deal with an aggressive fish, this unit has the muscle to help you win the fight. It comes with an all-aluminum frame along with a CNC-machined aluminum spool. Its main shaft is made from stainless steel which comes in handy when durability is of the essence. Looking at this unit closely, it’s hard to believe the fact that it packs so much power despite retailing at well below the $100 mark. Best of all, the baitcaster boasts a 6.3:1 gear ratio. That’s a high-performance gear ratio which gives you the flexibility to take on all manner of challenges. Most importantly, you also get a centrifugal braking system which goes a long way in improving the quality and accuracy of your cast. Looking to enhance your casting distance? This baitcaster boasts an enhanced line capacity thanks to the Kastking Spartacus Maximus feature which makes it easier to reach for the deep waters. And to make sure you enjoy peace of mind, this unit is protected by a 1-year warranty. Therefore, as far as value is concerned, we think this unit generally presents a competitive option for anyone. 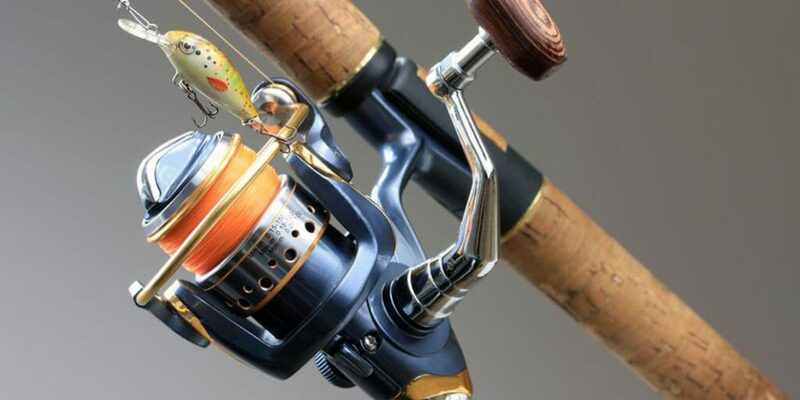 A while back, Shimano launched the Caenan line of reels. These are known to have quite a number of revolutionary features. For instance, you get an aluminum spool which is perfectly suited for saltwater fishing. In addition, you get an EVA handle which is quite grippy and stable. Most importantly, you get a ceramic line guide and a high-end clutch bar. Therefore, this Malaysian made baitcaster is, no doubt, designed to stun. Indeed, this unit is designed to compete with some of the finest baitcasters in the game. That’s particularly the case given the fact that it spots a 7.2: 1 and 6.3:1 gear ratio options. As such, this unit is quite usable. It’s also stylish and user-friendly. Above all, it packs a decent 11lbs worth of max drag force. So, if you’re looking for a baitcast reel that’s authentic, affordable, and reliable we definitely think one is worth your time. The first thing you’re bound to discover about this reel is that it’s such a looker! Indeed, it packs a fantastic low profile design along with award-winning chrome features. On top of that, it comes with an awesome reel cover. It generally boasts a nice touch. And on top of that, it boasts a nice design and an awesome set of instructions. So, there’s no denying that this reel is far beyond what your average fishing reel might offer. It is solidly built and, therefore, delivers a superior performance almost all the time. Another thing we couldn’t help but notice is that it offers a noticeably smooth action. It has multiple drag points which make it easy to fine tune the system to your liking. As far as power is concerned, this reel is meant to deliver nothing short of awesomeness. Indeed, it’s designed to deliver a competitive 17.5 lbs worth of drag. That basically means that it can do a great job of subduing aggressive fish species. That’s further made a reality by the fact that it comes with corrosion-resistant bearings for a long life and super smooth casting. What if you’re on the market for something that’s cheap but still usable? The Abu Garcia baitcaster is renowned for being sleek, stylish and above all light in weight. It comes with a 1-piece graphite frame along with graphite side plates. That means it’s pretty light in weight but still quite resilient. That’s a pretty good thing owing to the fact that it’s also quite affordable. In other words, if you’re looking for the best baitcast reel under 50, this has got to be it. Along with its well-made chassis, this unit boasts 4 stainless steel ball bearings. This makes it extremely easy to operate and retrieve. On top of that, it comes with a superb Power Disk system which comes in handy in ensuring a smooth drag performance. This remains quite steady throughout the reel’s drag range. On top of that, we also noticed that this low-profile reel comes with a recessed reel foot. This handy feature is quite useful in providing a simple and comfortable grip. There’s also a superb MagTrax brake system in place. This one does a superior job of customizing the cast control and also accommodating different kinds of lures. We’d generally recommend the Abu Garcia BMAX3 to the discerning angler who craves for variety. Besides that, we’d recommend it to anyone who might be searching for a unit that’s light in weight and also pretty easy to control. 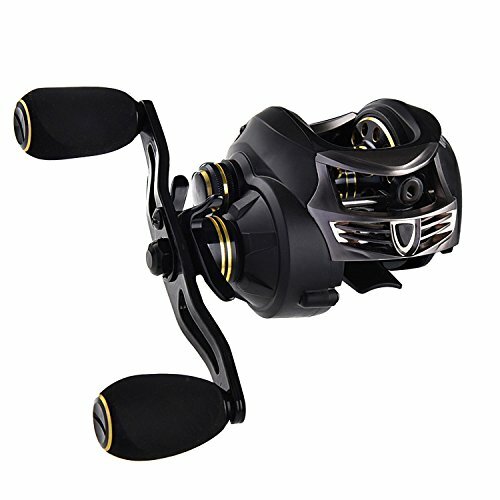 As a value conscious shopper and probably a beginner angler, this reel would do an incredible job of introducing you to the world of baitcasting. You may have heard of Kasking before but never had a chance to read an unbiased review of the Speed Demon baitcaster. Well, now this is your opportunity to get acquainted with the facts. The Speed Demon, first off, boasts an impressive casting distance. And despite it being priced at well under the 100 dollar mark, it doesn’t seem to compromise on quality. Thanks to its superb casting distance, it works pretty well with the heavier baits. These include the likes of lipless crankbaits, oversized top waters, and heavy spinnerbaits. Indeed, this is the best kind of a baitcaster to go for when casting even in a stiff wind. Another thing we absolutely like about it is that it doesn’t require constant adjustments. Its tension knob is pretty responsive which makes it a great option for anyone looking for excellence at menial adjustments. On top of that, this reel boasts a trilateral magnetic braking system. One good thing with that braking system is that it is pretty easy to use. Its spool is made from CNC machined aluminum. That makes it one of the best options available owing to its ability to accommodate lots of line – like a champ. If you’re after a great deal of power, the Torrent baitcaster from Piscifun is bound to wow you with what it has to offer. The unit boasts an 18-pound carbon fiber drag which means it can comfortably handle monstrous fish. Its parts are made from brass materials. In particular, its gears are made from machine-cut brass which means they tend to operate smoothly in addition to being quite durable. Indeed, this low profile baitcaster is renowned for its super silent high speed. It actually outperforms some of its more expensive competitors when it comes to retrieving the catch. Its unique side-plate oil port comes in handy in making this unit easy to maintain. And on top of that, you end up with an unparalleled combination of shafts which go a long way in eliminating backlash. The best news of the day is that this resilient baitcaster goes for a competitive price tag. In fact, it’s almost 50% cheaper than its KastKing and Shimano counterparts. If there’s one thing that stands out when the KastKing Stealth is mentioned, that has to be its lightweight design. Despite its massive looks and an incredibly powerful drag, it weighs a scant 6 ounces. In other words, it’s approximately 20% lighter than your average casting reel. And that’s certainly some good news for anyone who’s planning to fish for long hours. As you know, holding on to too much weight can lead to serious hand fatigue. Therefore, by knocking off a few ounces off its weight, the KastKing Stealth comes across as an ideal bet for the busy angler. The game-changing reel boasts a carbon frame which although not as tough as aluminum is still quite resilient. On top of that, it comes with a 4 layer disc drag system. That’s pretty much all you need to subdue even the largest fish in the waters. 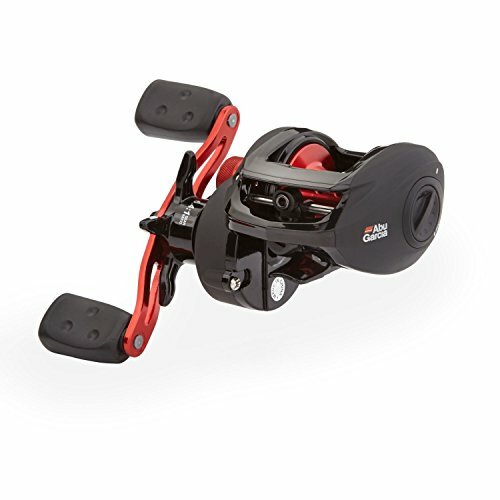 Moving on, this reel delivers an awesome 16.5lbs of dynamic drag without hesitation. Indeed, that’s the kind of stopping power that you can always count on even on a rainy day. Yet another extremely lightweight baitcaster is the New Assassin which weighs a paltry 5.7 ounces. It is made from a “Bulletproof” carbon construction and that makes it quite light yet powerful. Indeed, the New Assassin is quite rigid which means it can be exposed to all manner of challenges. On top of that, it can be handled for long hours with no worries of hand fatigue. On top of that, it comes with a 4 disc carbon fiber system. This provides it with a respectable 16.5lbs drag which is guaranteed to stop them dead. Moving on, the unit comes with a 6-pin dynamic dual braking system. Indeed, the system features both magnetic and centrifugal brakes – and that’s pretty much all you need for a laser-focused casting accuracy. Its corrosion-resistant bearings are paired alongside an aluminum spool thereby making this baitcaster quite dependable. Indeed, you can confidently use the system along with a braided line so you can confidently face those ferocious saltwater beasts. Last but not least, this baitcaster reel is such a looker! It features an awesome black finish along with brilliant blue accents. So if you’re looking for great aesthetics, this is certainly worthy of your attention. Since 1949, Lew’s has been one of the most innovative fishing tackle manufacturers. In fact, they’ve been marketing award-winning baitcasting reels since the 70s. That said, they’re not the most popular name in the world of baitcasting as they had disappeared from the market for some time. One of their latest inventions is known as the Speed Spool LFS. Being an introductory unit, we think there’s still lots of room for improvement although the reel is generally awesome. Some of the awesome highlights of the reel include the fact that it comes with a one-piece aluminum frame. It also boasts a magnetic braking system which can be adjusted externally. Another creative feature included in this unit is a "palmable" design which gives you a greater control when casting and retrieving. It is also worth acknowledging the fact that this unit weighs slightly over 6 ounces. Of course, that’s far lighter than most reels on the markets so far. That said, it seems like this reel is primarily made for freshwater use. Irrespective of that, it still packs some anti-corrosion features which are there to protect you, just in case. However, from its design, this might not be the best option for saltwater fishing. Although it can still get the job done, it’d struggle to keep things moving for long. 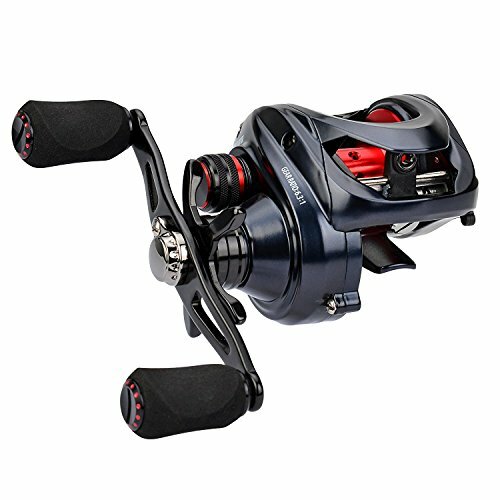 Borrowing heavily from the unique design inspirations seen on the Revo and Orra lineups, this Abu Garcia Pro reel is meant to provide a first-rate performance. Indeed, it is designed to maximize on smoothness at all times. Also, it comes with an externally adjustable line-up of casting brakes. These come in handy in providing a great level of casting control. On top of that, you get a 7+1 stainless steel bearing system. This one is specifically designed to deliver a seamless retrieve. So, you end up with a lightweight reel that’s compact and particularly engineered to withstand a torturous use no matter the conditions. Best of all, this unit is made from a one-piece graphite frame. Coupled with the fact that it’s a one-piece frame, you can rest assured that the unit will remain easy to handle in the long-run. 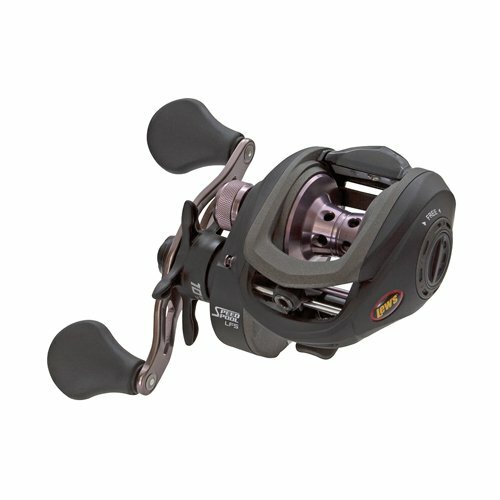 For maximum comfort and control, the reel comes with an EVA handle which is grippy and comfy. And the icing on the cake is that you’ll find its double-anodized aluminum spool quite user-friendly and powerful as well. This might also be a fantastic choice to settle for if your desire is to get a reel that’s compactly designed. On top of that, we think that the Abu Garcia Pro represents a competitive long-term deal. There are two common profiles to choose from. The round profile and low profile variants. The round profile caliber of reels is meant to hold heavy, braided lines. 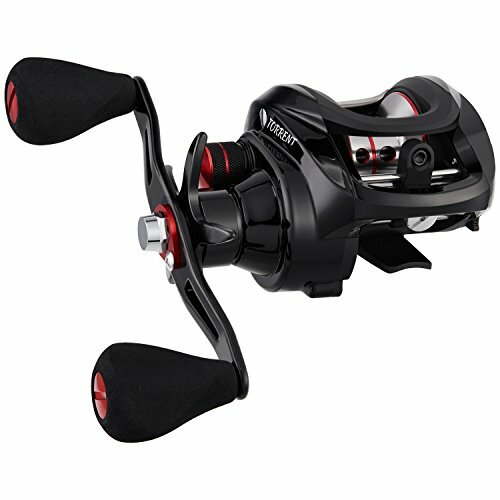 Low profile reels, on the other hand, are meant for medium-sized and small fish. But even then, they’re much more comfortable to use all day. They’re light in weight and provide you with optimal control. Just like with the profiles, there are only two predominant material variants to choose from. High-end baitcasters are typically made from aluminum. Cheaper reels are generally made from graphite though they may still have a few aluminum-made parts such as the spool. The spool is the surface on which the line is held. Most good spools are made from aluminum – CNC machined. However, it’s not uncommon to come across cheaper ones made from graphite. Another point worth noting is that round profile baitcasters are designed to hold more line than low profile ones. Basically, your decision on the spool size to settle for should be determined by the style of fishing you prefer. If you like casting far away and into the deep waters, then a large spool would come in handy. It’s important to understand the gear ratio concept before proceeding to make a purchase. This ratio is normally represented in numbers such as 7.2:1 or 6.3:1. The first number represents the number of revolutions per turn. Therefore, a 6.3:1 delivers 6.3 revolutions per turn on its handle. Likewise, a 7.2:1 delivers 7.2 revolutions. The larger the ratio, the faster the reel gets. We recommend going for bearings that are labeled either as stainless, double-shielded or shielded. Those kinds of bearings have the track-record of supporting the gears in addition to keeping the reels operating smoothly. While at it, don’t let the number of bearings used fool you – it’s the quality that matters. What is "drag" in baitcasting? Put simply, drag refers to the tension put on the spool. The higher the level of tension, the easier pulling the line off the spool becomes. A good drag system makes it easy to control the fish even if it attempts to make huge runs. All the 10 baitcasting reels reviewed above either have a centrifugal, magnetic or combined braking system. A strong braking system comes in handy in reducing the levels of backlash that may occur on the spool. Centrifugal brakes are designed to work using sliding weights. These are normally located around an axis point. This braking system is quite manual but nonetheless, it still serves its intended purpose. How does a magnetic braking system work on a baitcaster? Well, this system capitalizes on the attractive force between two magnetic poles. As the spool roles out, two magnetic poles automatically move toward each other leading to an increase in magnetic tension. This tension slows down the spool effectively preventing a backlash. We generally find the magnetic braking system more convenient to use. However, a combination of the two works even better. One of the things you primarily need to do with your reel is to make sure you keep adjusting the tension until you get a controlled lure fall. Basically, the tension adjustment feature provided should be capable of providing enough power to match the power of your spool. Likewise, you need a stronger tension if planning to use large lures. Q: What are the reasons to pick a baitcaster over a spinning reel? Ans: Baitcasting reels are best suited for fishing medium-sized and large fish. Spinning reels, though easier to use, are kind of flimsy and also give a limited control over the cast. Q: What gear ratio would you recommend for a beginner? 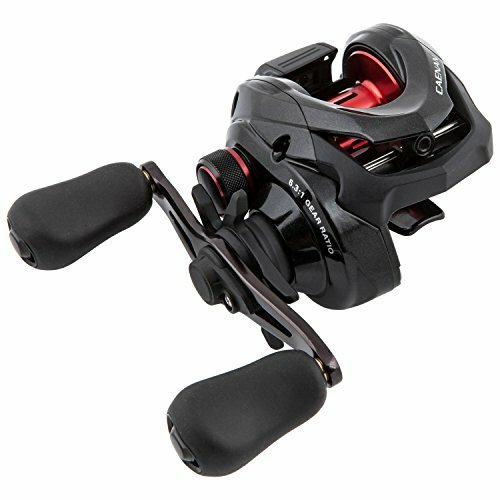 Ans: Choose a gear ratio that suits your style of fishing. Go for a high gear ratio e.g. 7.1:1 if planning to catch topwater frogs. Lower ratios come in handy when you want to roll heavy spinnerbaits or pull hard with big swimbaits. 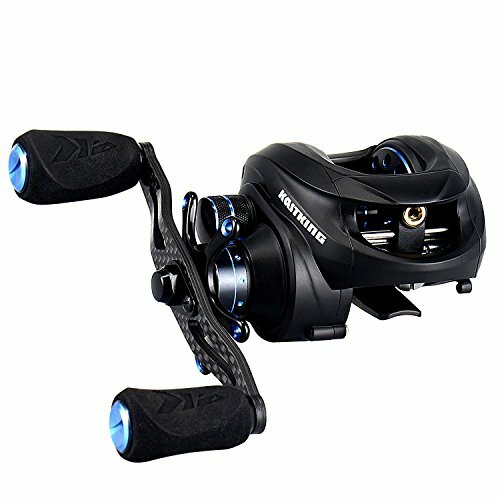 The Kastking Royale Whitemax Low Profile Reel would ultimately bag the top honors on this review. It has a powerful drag and a reliable dual braking system. Most importantly, it’s light in weight and has an EVA handle which is convenient to handle for long hours. The first runner’s up slot on this list would go to none other than the Shimano Caenen 7.2: 1 or 6.3:1 Ratio Baitcast Reel all thanks to its enhanced line capacity and sporty looks. Its limited drag and frequent bird nesting complaints deny it the right to top the rungs. If you’re ready to experience a new level of recreational fishing fun, it’s time to give baitcasting a shot. But in order for you to get the best experience out of that, we’d recommend investing in a well-made baitcasting reel. And as we have seen from the reviews above, even with a lean budget, it’s possible to become a proud owner of award-winning fishing gear.